Outdoor lighting can be an important part of a landscaping plan and is essential to a well groomed lawn. If you are lucky enough to have an area of your yard known as a garden, then you might be interested in some of the many different kinds of solar garden lighting there are and how you can use them. The advantages of using solar garden lighting over other outdoor light fixtures are many. First, you will not need to worry about burying cords. Regular garden lights are always tethered by a cord and in order to avoid tripping hazards and animal ruining the cords you are forced to bury them. This labor intensive task is not necessary with solar garden lighting because there are no cords. Another advantage would be the lack of light bulbs. Light bulbs tend to wear out quickly and need to be changed often. In addition, there is always the risk of a light bulb breaking and then having to clean up broken galls all over your garden. With solar light fixtures, there is no light bulb to wear out like with other outdoor lighting fixtures. The light emitting devices or LEDs last for a lifetime. The only maintenance that solar light fixtures need is to occasionally change the rechargeable batteries and wipe off the solar collecting panels. A third benefit of solar garden lights is that they can often be hidden or disguised as something else because of the lack of light bulbs and electric cords. This ability to disguise means that you can have decorative elements added to your garden both at night when the lights are lit and during the day. 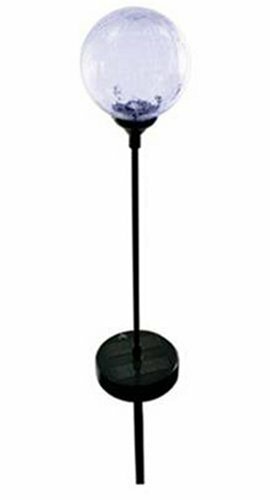 Also, it means that you can find a solar garden light for your lawn or garden no matter what the size or theme. These realistic looking solar powered LED rock lights are perfect for gardens, walkways, flowerbeds or wherever a nice accent light is needed. Solar panel charges up the rechargeable batteries during the day and the light automatically comes on at night. One of the most popular types of solar garden lights is the solar rock light. These decorative light fixtures easily fit into almost any garden because you can use them as part of your rock border or as a decorative boulder strategically placed throughout the garden. Usually the rock is placed such that the face that has the exposed LEDs is facing away from the road or wherever people might observe the garden from. 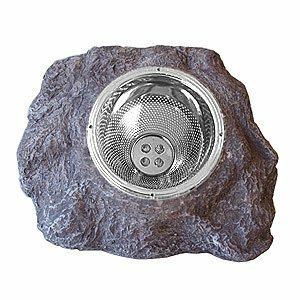 The other sides of the rock light fixture will look like any other rock. Solar rock garden lights come in all shapes and different kinds of rock imitations. For example, some rocks resemble limestone while others might look like something more exotic like quartz. There are some examples above. If your garden is not trimmed with rocks or you do not want random rock likenesses placed throughout then your tastes might trend toward rock statues or rock statuettes. You can find solar statue light fixtures in almost any theme and in many different sizes. 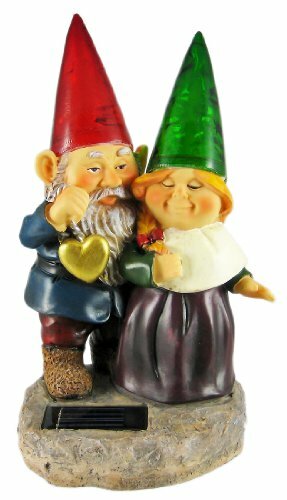 One very popular genre is garden gnomes. Garden gnome statues are silly little statues that some gardeners collect with a passion. They started appearing in gardens in the late 1960s to 1970s. The inspiration for garden gnomes comes from both Walt Disney’s Snow White and the Seven Dwarfs and a mythical creature from Scandinavian folklore called a tomte. Since people are going to put garden gnomes in their gardens anyway, they might as well get some lighting out of it. Usually the solar light emits from some convenient place so that you cannot notice the LEDs during the daytime hours. Because most of the statues are so low to the ground, you do not get a huge amount of light shining on to the rest of the garden. Instead, you mostly just light the statue and it is purely decorative solar lighting and not functional. 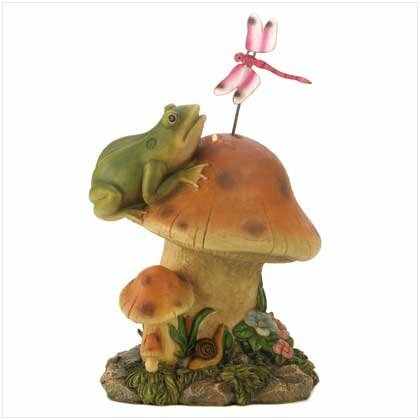 A plump green toad shares his perch with a dancing dragonfly in this fairy tale scene of forest fun. This playful statue adds a gleeful nighttime glimmer to your garden with hidden LED solar lights! Weight 4.7 lbs. Polyresin. Solar powered battery included. 9 1/2″ x 7 3/4″ x 14″ high. If garden gnomes are not your thing, you can probably find a solar light fixture for your garden in almost any theme you desire. The same concerns that were present with the gnomes still exist in that you do not get a lot of light off of a garden statue light fixture and the solar light shed into the garden is more to illuminate the statue than to light the garden. Some common statue subjects are small animals that might naturally find their way into a residential garden such as a rabbit, a frog, a turtle, chipmunk, or squirrel. Another kind of solar garden light is globe lights. There are actually two different kinds of globe lights we can talk about. The first kind is small globe lights that are attached to the end of sticks that you put into the ground. When it is dark, it appears as though the globes are floating above the garden because you cannot see the sticks holding them up in the dark. These globes may be smooth or beveled. 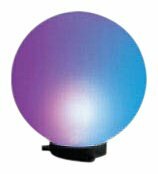 A second kind of globe light is a large globe that sits on a pedestal in your garden or yard. These globes are decorative items both during the day and at night when they light up. Solar accent lights are a variety of garden lighting that is usually only noticed at night because the fixtures are so small that you do not notice them during the day. One popular choice is small fireflies or butterflies that are on the end of wires sticking into the ground. 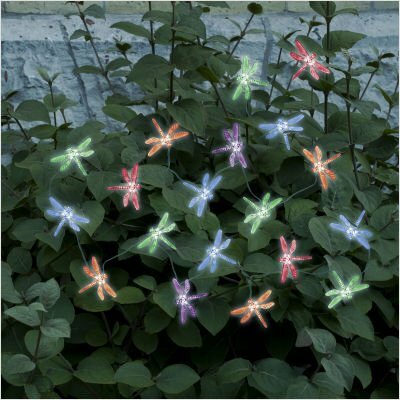 The small solar lights are no bigger than the real insects and they give an impression of insects flying around the garden at night. 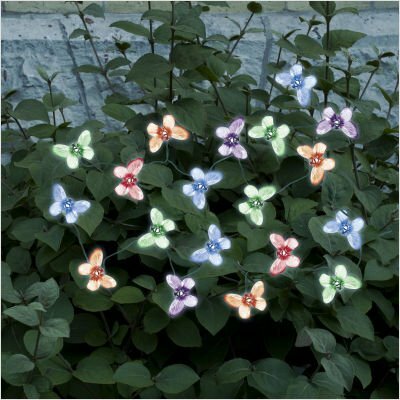 They contribute a whimsical feeling to the garden and will shed a small amount of light on the surrounding area if you are interested. If your landscaping is extensive enough, then you might have a small pond or water fountain in your yard or garden. If so, you should take advantage of floating solar lights. Again, because there are no electrical cords, there is no concern with having the lighting so close to the water. 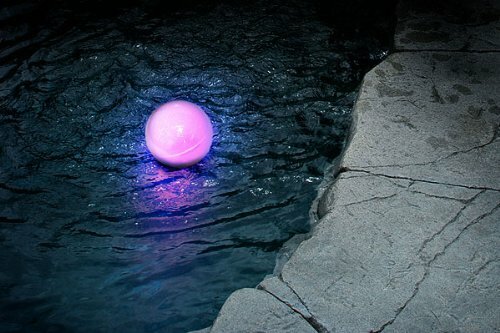 The solar lights have a weight that submerges under the water and a globe or lily pad type light fixture floats on the surface.